Built by Palamos in 1988 Vixen is a standard Strider, that is to say she has daggerboards and a narrow deck (not up to the mast like the Club Strider.) There are also running backstays. She has had Bowmar hatches fitted to the coachroofs making the hulls much lighter inside. Since 2000 when I bought the boat she has had new sails (the headsail is only 2years old) new standing rigging, new tramps, new rudders and a new 4hp Mercury four stroke outboard. There are two GPS one built in and working with the digital VHF. 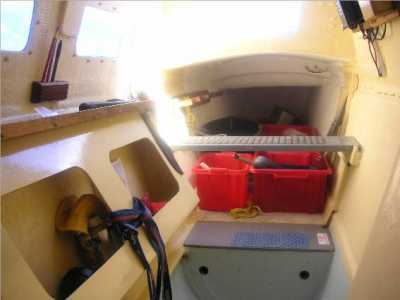 The other hand held GPS has fittings on the cabin so that it can be moved to whichever side the helmsman is sitting. 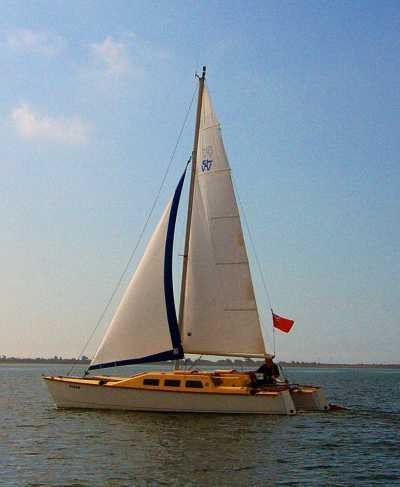 Vixen was raced seriously in her earlier life, I have been gradually developing her as a cruising boat. The price includes an excellent purpose built road trailer which has had new springs and brakes fitted and is ready to tow anywhere. The boat can be delivered anywhere in the UK within reason.